Everyone should consider making a Will and, once a Will has been made, it is essential that you continue to review your Will on any change in personal circumstances: for example, the death of a loved one, birth of a child or breakdown of a relationship. The consequences for a deceased’s family if no Will is in place can be very distressing. This can be for a variety of reasons. A Will appoints Executors to avoid the additional expense of the court having to appoint them when you are gone. It leaves clear direction on how property should be divided to avoid indecision or family arguments. Cohabitants now have the right to claim on their partner’s estate if no Will is in place. So if you are living with a partner but do not wish them to inherit your property it is essential that it is put beyond doubt within a Will. 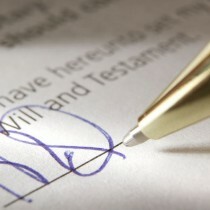 Equally, if you do want them to inherit it is important to make the proper provision in a Will. Parents of young children should leave direction to friends and relatives concerning the care of any children under the age of 16 that survive them and this can be achieved through a Will. It is important also to protect youngsters from inheriting before they are mature enough to deal with substantial assets. Where children or other dependents are disabled in some way, these matters are brought into sharper focus. The preparation of a Will when you have Second Family can often be a real headache. Often, the laws of succession do not correspond with the modern family set-up. There are various mechanisms that we can use to ensure that everyone gets their ‘fair share’. If you own a business, it is important to consider what will happen to the business if you are no longer here to be a part of it so that the value of the business is retained. Funeral wishes can also be confirmed in a Will. What can be an upsetting topic of conversation with a loved is sometimes more easily addressed by your Will. Trusts can be used for tax planning, to protect young or vulnerable persons and to preserve assets. We try to look at the bigger picture and where appropriate create the right type of trust to give you peace of mind now and in the future. For anyone at any stage of life but particularly for the older client, careful consideration should be given to putting in place a Power of Attorney. This is a document that gives others the right to ‘step into your shoes’ and to deal with property or welfare if you become incapacitated through illness or old age or as a result of an accident and you are no longer able to make decisions for yourselves. Without a Power of Attorney, an application may need to be made to the court for a Guardianship Order. This can cost many thousands of pounds. Having proper arrangements in place will avoid anxiety, uncertainty and expense at a later date and will be hugely advantageous for family members. When a family member of close friend has become incapacitated for some reason (old age, illness or accident), and no Power of Attorney is in place, a Guardianship Order may be required to allow someone else to deal with their property or welfare on their behalf. The Adults with Incapacity (Scotland) Act 2000 operates to protect incapacitated individuals to ensure that they are treated with respect and after giving full consideration to their feelings and circumstances of life. For this reason, a Guardian may be required or some other type of Order to ensure that this is done. The process can be long so we recognise that it is important that everyone involved is kept up to date and that matters are dealt with efficiently. When there is a death in a family there is a lot to think about. We can help Executors deal with what can sometimes be a complex administrative process. We deal with Executries sympathetically, and efficiently, taking regular instructions from Executors and keeping family members fully up to date at each stage of the process. Interested in our Wills and Trusts / Private Client Services?